Georgia Ave. Ramp Closed in Md. You might want to think about taking another route if you normally take Georgia Avenue from Maryland into the District. 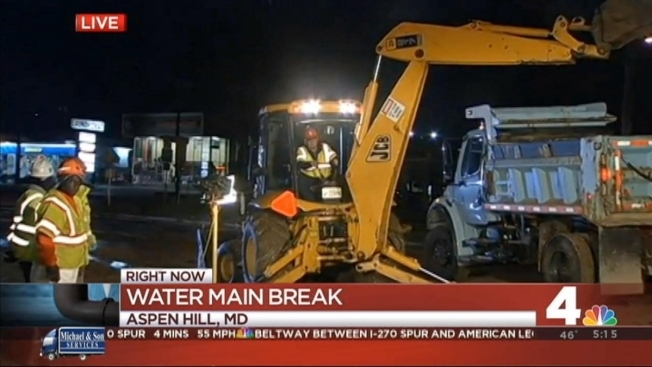 Crews are working to repair a 10-inch water main break in the Aspen Hill area, but the effort will take several hours -- throughout the Monday morning rush hour, reported News4's Megan McGrath. The dedicated turn lane from southbound Georgia Avenue to southbound Connecticut Avenue is closed due to a water main break. Drivers wanting to turn onto Connecticut will instead have to wait for the traffic lights and then take a hard right onto Connecticut. Drivers should take Norbeck or Layhill roads as alternate routes, or avoid the area completely.